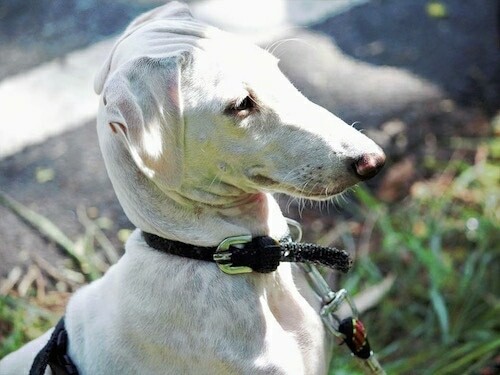 The Caravan Hound’s head is long and narrow and broad between the ears with a tapering muzzle. The jaws are long and powerful, but deceptively weak looking. The nose is large and may be black or liver colored. The ears are moderate in size and hang close to the skull. The eyes are large and oval in shape, being dark hazel to amber in color. The expression is a piercing gaze. The neck is long, clean and muscular and fits well into the shoulders, which are well-laid back. The forelegs are long, straight and well-boned. The back is long, broad and well-muscled with a slight curve over the loin. The loins are wide and deep. The chest is strong and deep with well sprung ribs. The abdomen is tucked in. The hindquarters appear wide and well-muscled. The tail is strong at the base, not too long, set low and carried in a natural curve. It should never be carried curled over the back. The gait is high-footed, flexing all four legs. The coat may be short and smooth or of a silky texture, sporting fringes on the ears, legs, backs of thighs and tail. All colors and combinations of colors are seen. Aloof and independent but highly intelligent and a keen hunter, reserved with strangers. 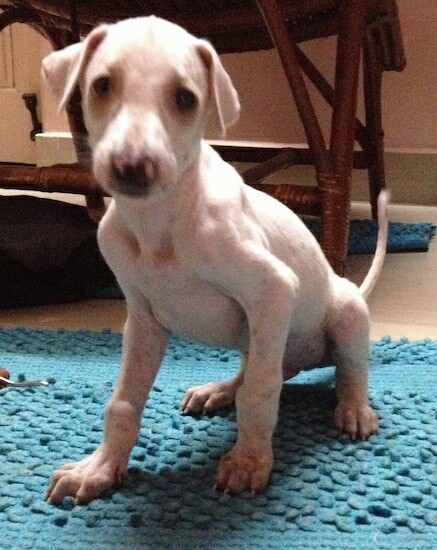 Does not like to be touched or handled by anyone other than its master. Can and will protect that which it holds dear if need be, the Caravan Hound needs a great deal of socialization starting from a young age. Owners of this breed need to be calm, with an air of gentle, but firm authority over the dog. The rules of the house must be made clear in a way the dog can understand. Survival of the fittest has been beneficial to the Caravan Hound and as a result the breed suffers from no specific health issues. The Caravan Hound is not for life in an apartment. It does best in a home with access to a large, fenced yard. It does not fancy cold, wet climates. It is happiest outdoors, and is at home in tropical climates. If kept in a cold environment, extra protection such as winter coats and doggy boots are required. This is not the type of dog that does well living alone; it needs human interaction and must be an integrated member of the family. It will not handle being crated for long periods of time very well. Being a sighthound, the Caravan needs a tremendous amount of daily exercise in order to remain physically and mentally sound. Daily long walks where the dog is made to heel beside or behind the person holding the lead are essential, coupled with long, weekly or bi-weekly running sessions in a large, enclosed, safe area. Never allow a Caravan off leash on unfenced ground, as it has the ability to become selectively deaf to its master’s calls should anything catch its attention and trigger a chase. Exercise is one of the key ingredients to a well-adjusted Caravan, so if you cannot provide enough of it, please do not think of owning this breed. None is required for the smooth variety. A weekly brushing for the feathered is all that is needed. The Caravan Hound is an average shedder. The Caravan is an ancient breed, native to the Deccan Plateau of India. This region covers parts of the states of Maharashtra, Karnataka and to a lesser degree, Andhra Pradesh. 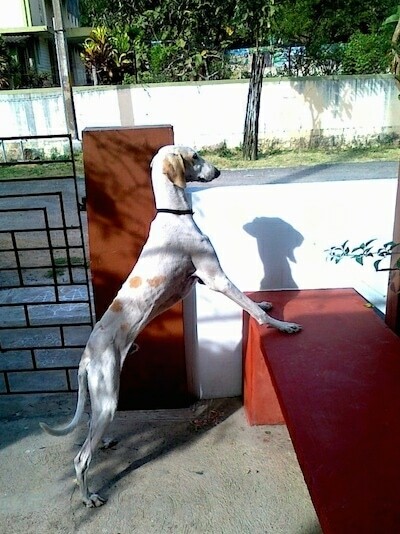 The breed is basically an offshoot of the Saluki and was first introduced into India by traders and mercenaries from various parts of Asia, who traveled in caravans. When local people saw the dogs running alongside the caravans, they began referring to them as “karwani,” meaning “of the caravans.” The name endures to this day in the villages, but it was Anglicized to Caravan Hound when the Kennel Club of India recognized the breed. 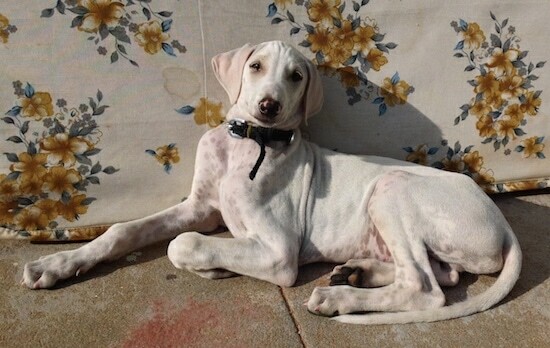 In Karnataka, the breed is also known as the “Mudhol Hound,” after a small town in Bijapur district. A former ruler of Mudhol, Sri Srimanth Raja Malojirao Gorphade, had presented a fine pair of these dogs to King George V of England. 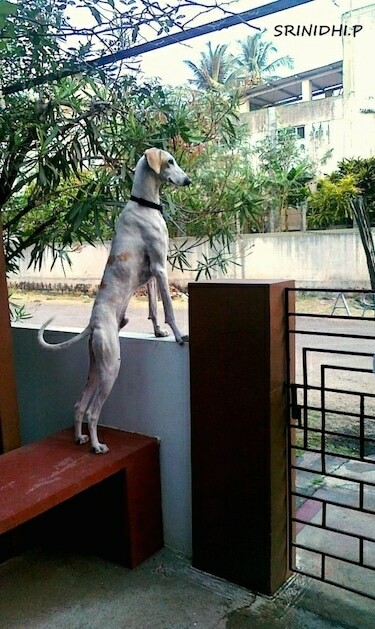 Upon inspecting these curiosities, the monarch found them true to sighthound conformation and dubbed them “the hounds of Mudhol.” However, since it is not found only in Mudhol, but is widely kept throughout the Deccan, the correct name for the breed remains Caravan Hound. The feathered variety may be referred to as a Pashmi. 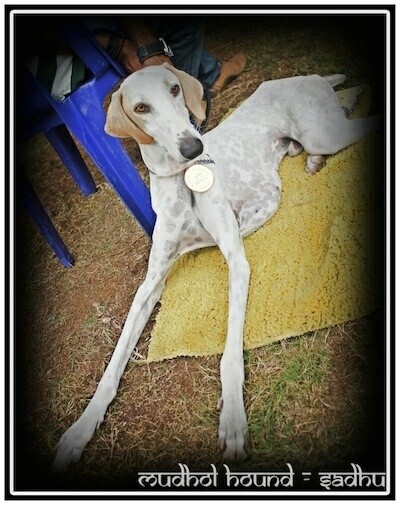 Sadhu the Mudhol Hound at 2 years old from India—"Sadhu the Mudhol Hound is registered under the KCI (Kennel Club of India). He is a wonderful and genuine purebred dog."